There are 50% off some shows of The Full Monty at the Cliffs Pavilion Westcliff 1st – 6th April. The special link came to us in an email – hopefully this link will take you to the right webpage. Or try the promo code: “50% off tickets Mon – Wed – Full Monty” (without the quotes). Space Theatre, on the Isle of Dogs are currently running “The Conductor”, a play about Shostakovich working away inside Leningrad during the 1941 siege. The theatre is walkable from Mudchute DLR. The amazing, and once totally unexpected, regeneration of the east side of London is hotting up! I took top photo here just 11 years ago from the old multi-storey car park at Stratford. 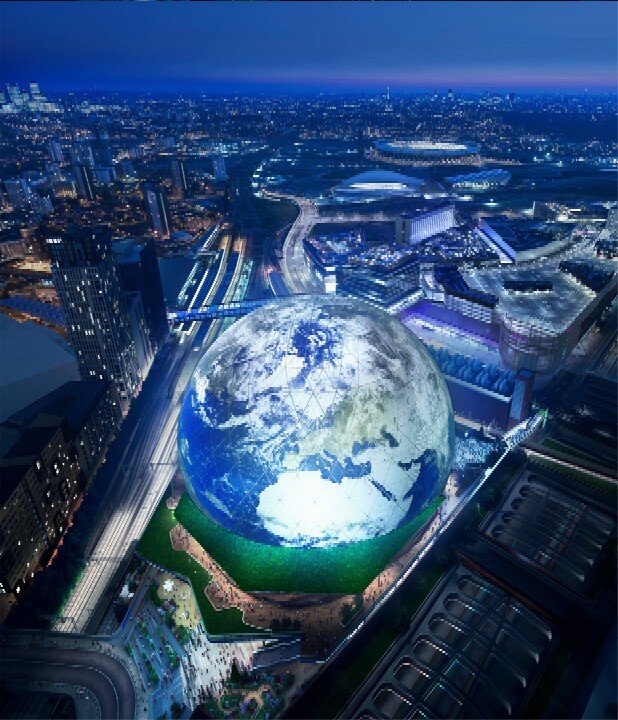 The 120 metre wide MSG Sphere will be covered in LED panels which can display live concert footage or advertisements. The Madison Square Garden Company have already submitted the plans. Read more in New Music Express. Next Post:What Does a ‘Liveable Neighbourhood’ Mean?